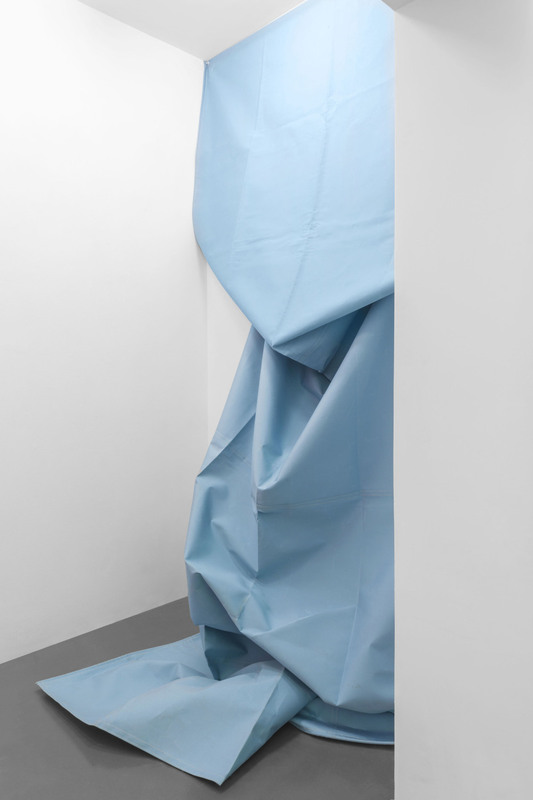 T293 is pleased to present Le Flâneur, Sonia Kacem second exhibition with the gallery. Coming as a result of a three weeks residency in Naples, the exhibition consists of an environmental installation and a series of sculptures on wall. All the works composing Le Flâneur have been conceived and produced according to the spatial and architectural properties of the gallery. Their conceptualization departs from the artist’ rethinking of the social and cultural aspects linked to awning structures and fabrics, and particularly on their suggesting memories of a suspended and unproductive time, like that spent on a cafe terrace during the summer. 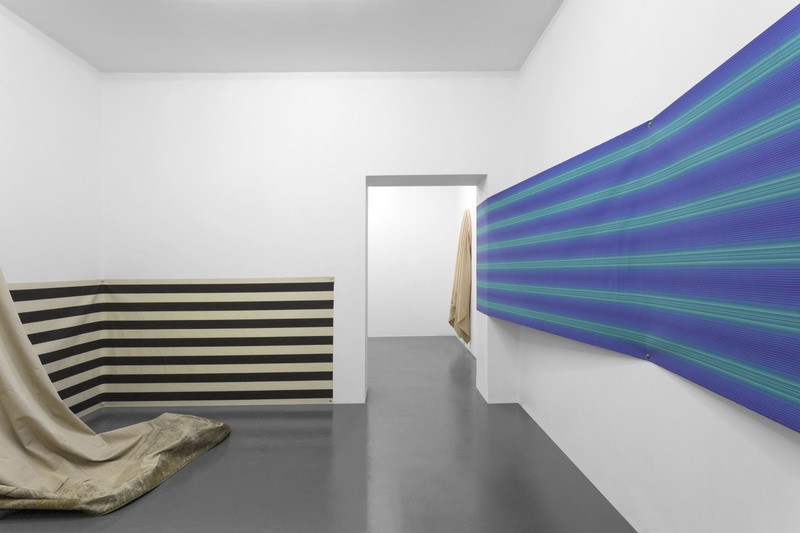 Taking advantage of the physical and chromatic properties of the awning fabrics, the Swiss-Tunisian artist creates a monumental installation that unfolds through the several rooms of the gallery. 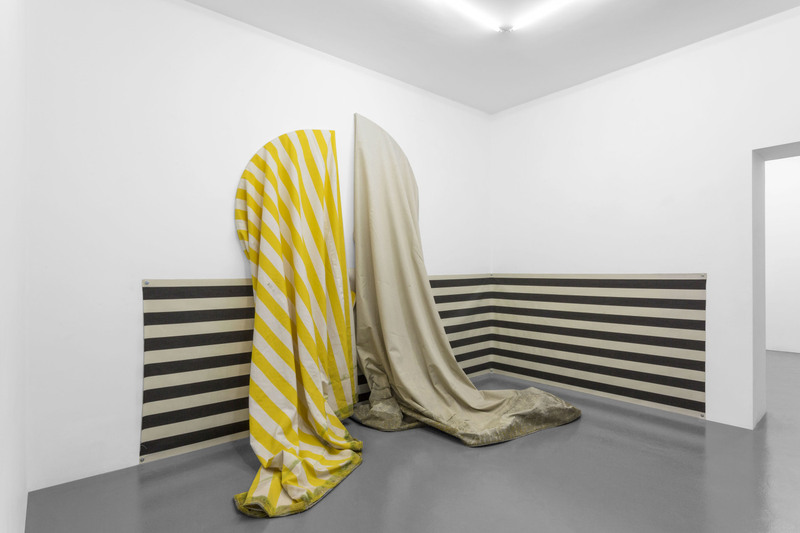 Like the artist’ latest installation Loulou (2014) and Bermuda Triangle (2015), this work speaks about Kacem obsession to turn flat materials like fabrics into volumes invading the space. 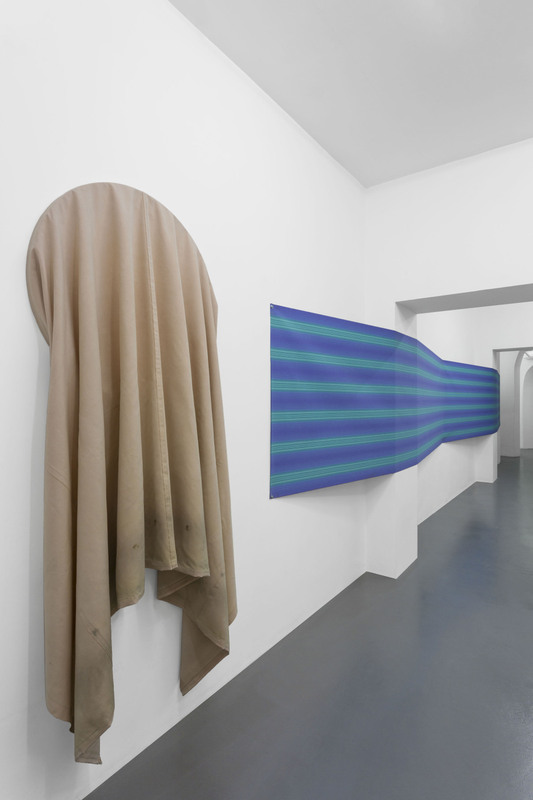 However, the peculiarity of this installation is that here is the movement of the texture through the space that exalts the shades of the colours composing it, thus revealing the irregularities and labyrinthine aspect of the space itself. In order to stress out the creative possibilities of the interaction between materials and forms, and to reflect upon how their relation shapes our experience of time, the installation will be accompanied by a series of sculptures on wall. 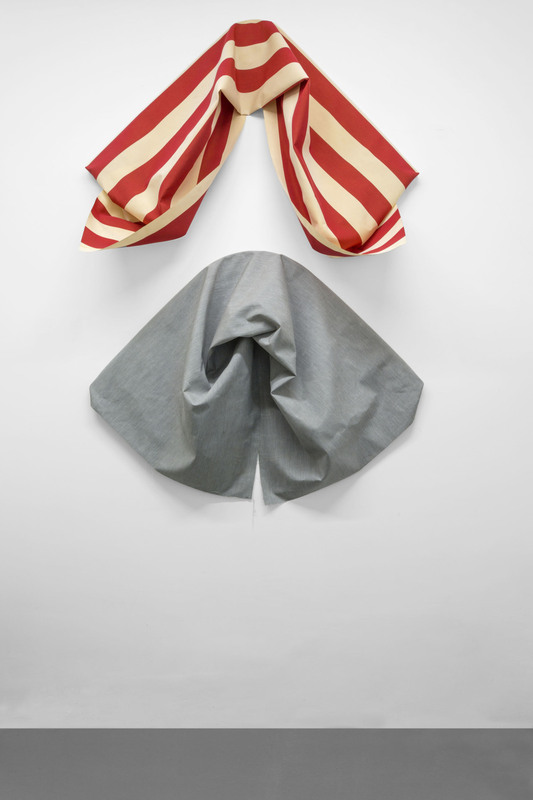 Made by the same awning fabrics that compose the installation, the sculptures also have a wooden structure that sustains them. Their form has been inspired by a dismantled coat hanger, collected from the street and manipulated in the studio. 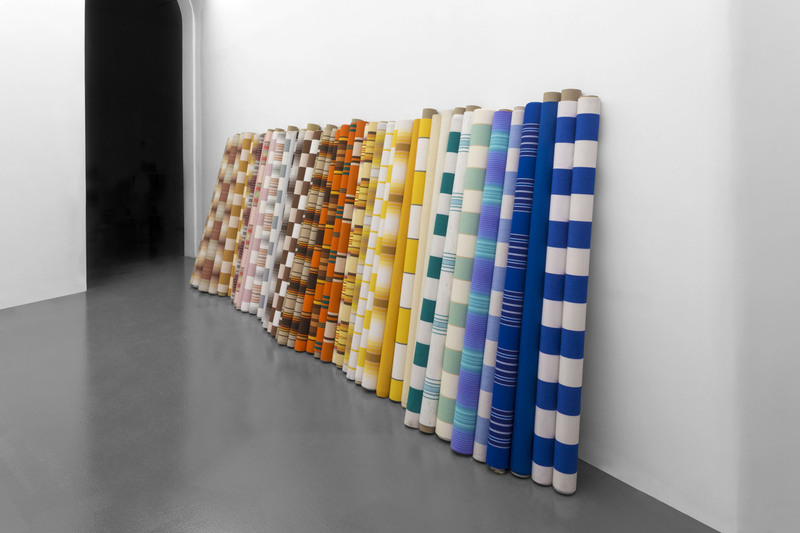 Another work that will be part of the show is made by a series of tubes of awning fabrics, arranged according to the gradation of their colours. 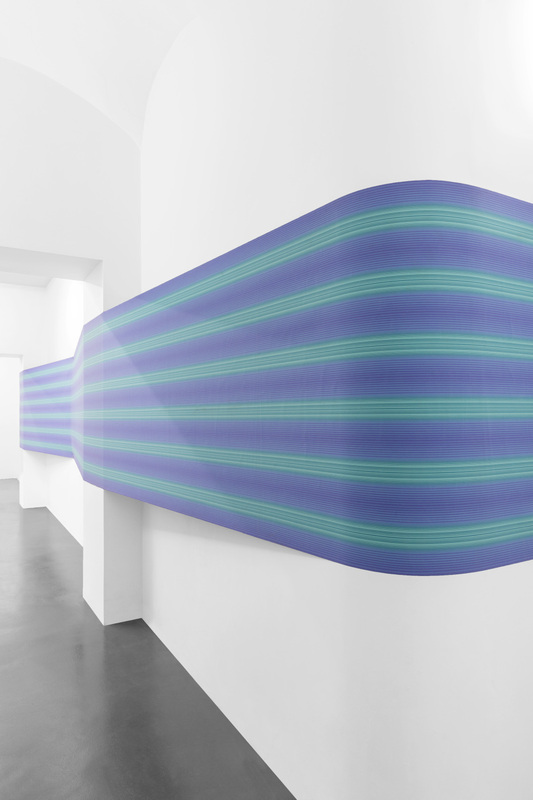 While keeping their functional aspect still intact, these readymades invade the space not only with their forms, but also with the chromatic effects resulting from the reaction of the different fabrics to the gallery’s artificial light. 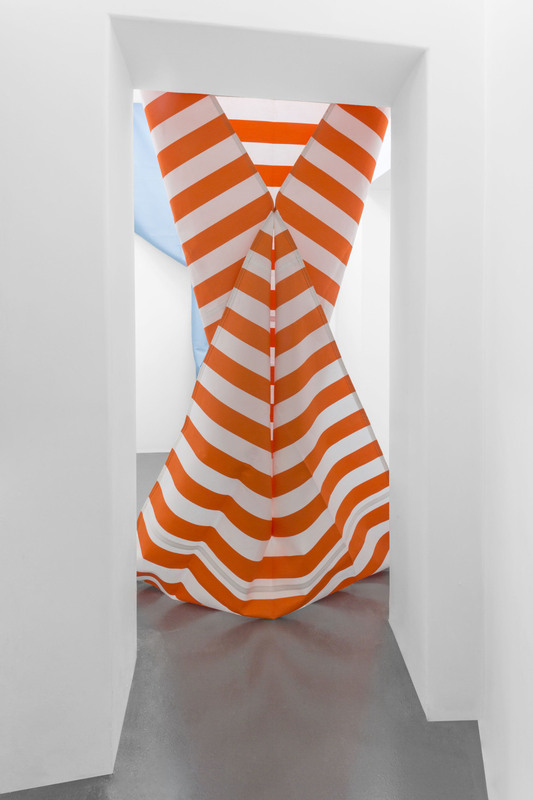 Exactly as these awning fabrics evoke personal memories of a time collectively experienced, the autonomous and builded forms composing Le Flâneur are meant to open the space for a bodily experience of both time and space. Kacem’s research has always been focussed on how to capture the action of time on the rough material. 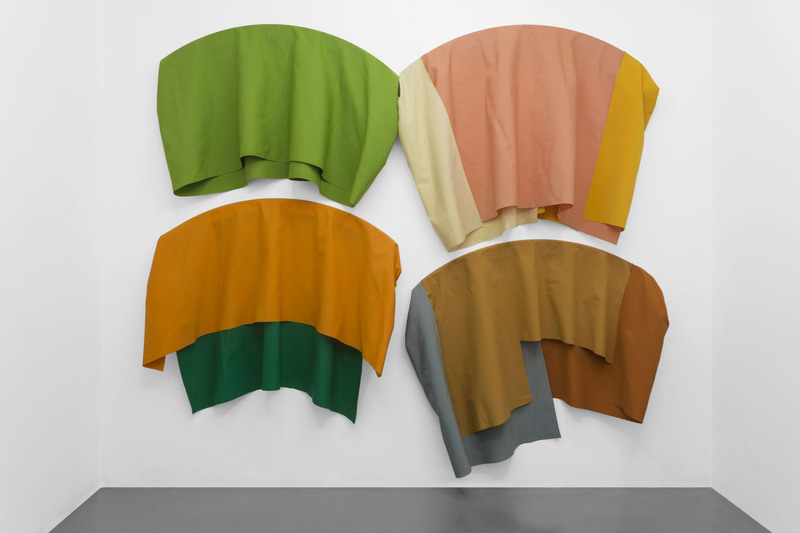 In Le Flâneur, this peculiar approach of the Swiss-Tunisian artist takes the form of an environmental intervention that plays with the physical and volumetric properties of both materials and colours. Indeed, the whole exhibition acts like a character that, wandering all around the city, slowly articulates the forms that inhabit the urban space, and the colours that accompany the development of light. It is like a body that walks with latent energy along the trails of fiction, while aesthetically remaining in the registry of abstraction.